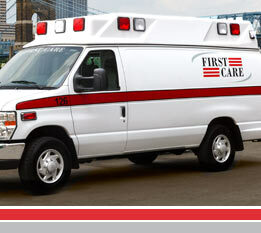 First Care Dayton provides ALS, BLS and Wheel Chair Van medical transportation services as well as standby medical coverage for all types of sporting and other special events. We proudly serve our customers in the Dayton area from our Englewood and Moraine stations, both of which are just minutes from the highway, ensuring quick response times to your area. Our staff is very familiar with the special needs and requirements of those in need of transportation services in our Dayton community. Our Paramedics are certified by the Department of Emergency Medical Services, as well as holding Advanced Cardiac Life Support certification. First Care employees receive the same training and carry the same equipment as 911 Paramedic services. Our service is routinely inspected and certified, unlike most 911 services. First Care Dayton is proud of our outstanding service record and each and every employee is dedicated to providing the best possible patient care. Our communications and billing centers are glad to assist you with even the most challenging concerns, and will do everything possible to facilitate your transportation needs. First Care is proud to provide services customized to meet the needs of the Greater Dayton community. Please contact us to learn more about how we can support the medical transportation needs of your facility.